Generation YOLN or planning for the future? Reading magazines is a wonderful pastime for me, both for work and pleasure, but sometimes two magazines that come out the same week, can send out two somewhat confusing messages, provoking a long, meditative contemplation of the subject raised. A couple of weeks ago Grazia UK had an article titled ‘Hello Generation YOLN!‘ – I will admit to not having a clue what ‘YOLN’ meant until I read an article (You Only Live Once). Is the generation gap widening or am I no longer keeping up with all the acronyms? In the article Katie Glass argued that Instagram is somewhat ‘past it’ and the social media place to be is Snapchat. Katie went along to say that ‘trend-spotters Future Foundation suggests Snapchat is an app Millennials love because its instantaneous nature reflects an increasing desire for fleeting, spontaneous experiences: deciding in a moment to book an Airbnb in Amsterdam instead of saving up for months for that mini-break’. Ok, I am not a millennial and do like spontaneity sometimes, but with two kids it’s not like I can travel at a drop of a hat – having said that, if you don’t have kids or work responsibilities, I urge you to take the bull by the horns and have fun when you can – just don’t get in debt or trouble while having fun! This article reminded me of my fairly recent conversation with the fitness trainer Dalton Wong, who gave me an example of how our parents had to save for things they wanted, like a stereo or washing machine, while the young generation wants everything now. I agree, it’s wonderful to want and to have simultaneously, without saving or waiting, but if every gratification is instant, don’t we burn out, become jaded and narcissistic? There is something to be said for the anticipation of something special or for saving for something that you really want and that will make you happy for longer than five seconds, before you start lusting after something else. What’s wrong with making plans for the future, setting targets and moving towards them? It is like keeping fit – you won’t achieve perfect fitness overnight or thanks to a miracle pill, that by the way, for now, doesn’t exist. Some of our parents had a job for life, while we need to constantly evolve and develop new skill sets, often feeling we aren’t moving fast enough, aren’t keeping up and ending feeling up like failures. Does an instant purchase make us feel more satisfied deep down? Is travelling at a drop of a hat better than saving money for a special trip or a rainy day? Answering a question about the shift of priorities between different generations isn’t easy….. 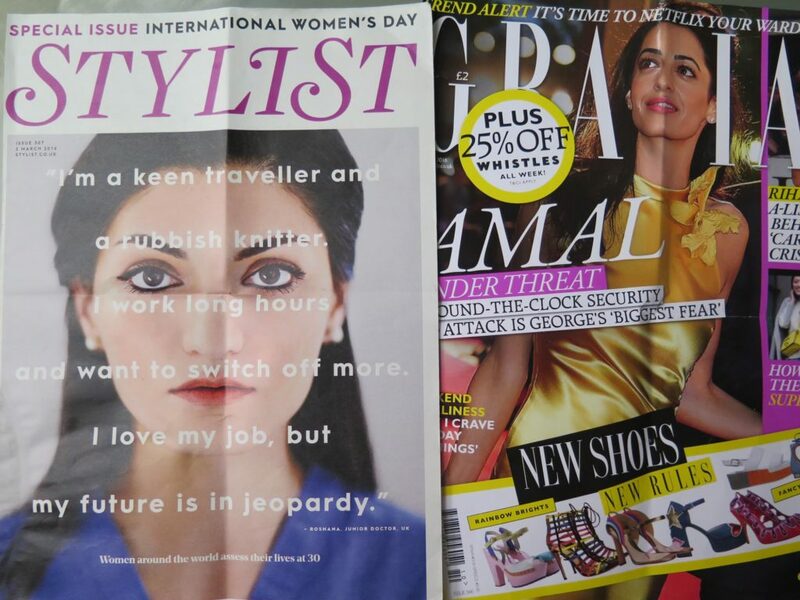 While I pondered that article, I picked up a copy of that week’s Stylist, which had International Women’s day as its main theme. The magazine focussed on ambitions, dreams and desires of 30-year-old women around the world and had a beautiful junior doctor Roshana ( yay for putting real women on the magazine covers ! ), with the tag line: ‘ I’m a keen traveller and a rubbish knitter. I work long hours and want to switch off more. I love my job, but my future is in jeopardy’. Roshana Mehdian is a trauma and orthopaedic surgery registrar who admits to not thinking too far ahead, as life is complex and takes unexpected turns. I really enjoyed reading her interview, as she seems to hold things like authenticity dear to her heart, a value that seems to be somewhat old-fashioned in our day and age, particularly when it comes to Millennials. Roshana works in a high-pressure environment that is quite male dominated and admits to sometimes feeling overwhelmed – by life and the workload that is only getting heavier ( Roshana’s interview came out on the week when junior doctors went on strike and that topic seems to be garnering strong & divided opinions ). During ‘hard’ times Roshana seems to draw strength from her past experience and wisdom of her mother, finding comfort in the integrity and gratitude that he parents instilled in her. It seems that irrespective of age most of us seem to be united by common causes – love, friendship, success at work, possibility of having kids or being a good parent. Of course, every age can be tricky to navigate and has its own set of challenges. While young people can focus on the now, older people have experience and responsibilities that don’t allow most of them just to be and savour the moment. Or maybe, just maybe, balance can be achieved? There are days when the pace of life is slower, we get lots of things done and seem to have more confidence in our abilities and the future. And of course there are days when you run like-crazy, drop juggling balls, get irritated and sensitive – nothing seems to go right on those days. Ultimately we are all united by the journey of life – we have all been kids, one day each one of us will reach old age, hopefully unscathed by tragedy or disease. Life is hard graft, it demands focus and determination, but we also need to know when to pause and just savour the moment like a good glass of your favourite wine, noticing the caudalie and the taste of fruit and notes that make us love it. Same with running – be it for fitness, clearing the head or in a marathon – as long as you remember to stretch before and after! Life is a journey, whether you are 20 or 50, navigating its speeding up rollercoaster curves takes grit and determination, just don’t forget to breath!